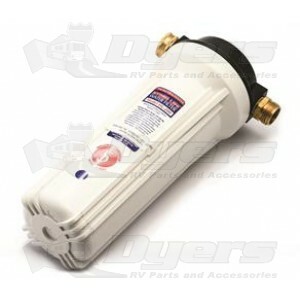 Designed with garden hose fittings so it’s easy to filter all of the water entering your coach! Exterior canister style filter system designed to be used between two hoses. Garden hose connectors for fast, easy hook-up. Features KDF and activatedcarbon. KDF is made of a high purity copper/zinc alloy that creates an electro-chemical oxidation-reduction that neutralizes harmful contaminates including bacteria. Removes or greatly reduces chlorine, heavy metals like mercury, VOC, chemicals, sediment, lime/scale buildup and that hydrogen sulfide that causes a rotten egg smell.